Just as we routinely measure and capture multiple aspects of a workout, there are also multiple aspects that characterize recovery. There are several factors that contribute to the speed of recovery, most notably sleep, diet (including hydration) and the absence of mental and emotional sources of stress. HRV can be a valuable way to track many of these recovery factors. Whereas heart rate (HR) measures the average number of heartbeats in one minute, heart rate variability (HRV1) assesses the differences in timing of each individual heartbeat, controlled by the body’s autonomic nervous system. 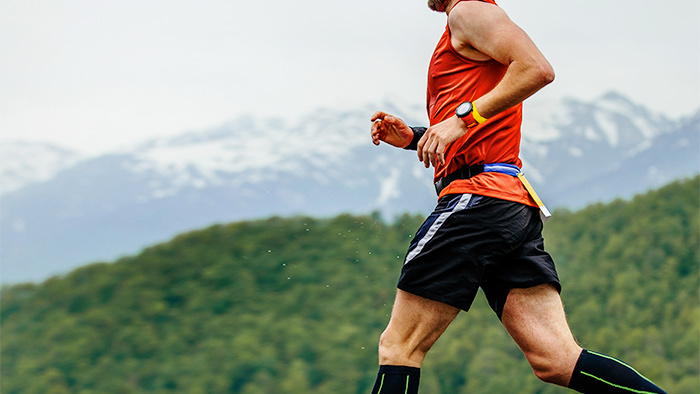 HRV is a much more sensitive measure than resting heart rate for understanding recovery, and is usually measured first thing in the morning to provide an indication of readiness to train for the coming day. HRV is an inclusive, individualized and objective measure of stress. How HRV changes over time can provide important clues as to which lifestyle factors are the most influential to any given individual. Understanding this and making adjustments accordingly allows for the greatest amount of training and therefore the biggest stimulus for adaptation of the body without it breaking down. At the last count, there were more than 21,000 published papers on heart rate variability, including multiple studies looking at how the various lifestyle and recovery factors influence HRV. It’s a well documented that good, quality sleep is a key recovery enabler. However, what is not widely recognized is the relationship between sleep and HRV. A higher HRV baseline, HRV before bedtime and smaller dips due to daily stress lead to better quality, restful sleep. Finding a diet that provides an acceptable combination of appropriate fueling for training, essential micronutrients for health, as well as one which is enjoyable enough to sustain can take decades. What works for one person may not suit another. One universally beneficial supplement is Omega-3 fish (or krill) oil. Omega-3 fatty acids have multiple beneficial effects on the cardiovascular system including stabilising heart rhythm, raising HRV and reducing the occurrence of arrhythmias. Tracking diet compliance in relation to HRV can help you understand how your body responds to different nutrition. Professor Stephen Porges describes HRV as “an index of stress and vulnerability to stress.” Acute stressors including workout sessions reduce HRV, with the amount and duration of reduction being proportional to the workload (e.g. TSS). The body is well equipped to deal with short-term stresses, and gets stronger during recovery once the stress has been removed. A higher HRV baseline signals greater resilience, with the body then able to handle larger and more frequent stressors. In short, if you manage your recovery well and improve your baseline you will be better able to manage stress and benefit from workouts, and in doing so will improve performance. Researchers monitoring workload and fatigue in professional cyclists during the Tour of Spain found a negative relationship between acute training load (ATL) and HRV, especially during the third week of the event. For amateurs, non-training stressors, such as work and family life are also likely to affect both perceptions of fatigue and HRV to a significant extent. Research has yet to find a solid relationship between training-induced muscle soreness and HRV. The good news is that with HRV in the normal (±1 SD) range, identified with a green light in ithlete, stiffness is likely to disappear within 30 minutes of warming up and starting exercise, allowing you to complete important sessions with confidence. Perhaps surprisingly, there is a very solid body of research linking HRV and mood states, and we often see a high correlation in users’ data. Clinically, persistent low mood state and depression are strongly associated with reduced HRV. Conversely, activities that enhance HRV such as meditation, yoga, slow deep breathing and of course exercise, significantly improve mood state. ithlete reads your daily TSS values from TrainingPeaks allowing you to track your objective training data alongside ithlete’s HRV and resting HR values. Along with your HRV and RHR data, your self-reported stress metrics (Comments, Fatigue, Mood, Muscle, and Stress) are also sync’d to TrainingPeaks so you and your coach can see the complete picture your training and recovery. Throughout this post, “HRV” is used to refer to breathing-rate high frequency beat to beat heart rate variations measured over a short (one to five minute) period using measures such as RMSSD, SD1 and HF.